Or view larger version. A Californio ranch near Monterey. ca. 1849. Alfred Sully, artist. Watercolor on paper. Collection of Oakland Museum of California. "The times prior to July 1846 and all their honest pleasures…Halcyon days they were. We shall not see their likes again." 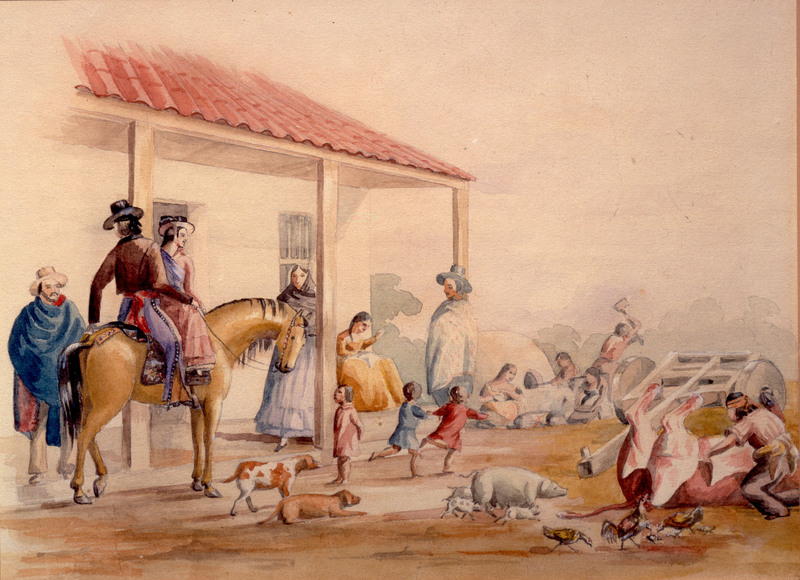 This image depicts a group of Californios relaxing on ranch lands. A man on a horse looks on as laborers work in the background. During the Mexican period of California history, the ranchero was the basis of California's social and political system. While Native Americans served as the primary labor force, wealthy Californio families enjoyed the role of landed gentry.